The following is the unedited version of a book review I wrote that has appeared in 'Design Detail' ( Vol Issue 5) magazine. The review is a bit lengthy, but those interested in sustainable architecture might find this book very useful. Sometimes one has to go back to the basics to fully understand a concept or a word, so that its meaning light up your mind in a brilliant flash. Take for instance the word, 'architecture'. Google says - 1. 'The art or practice of designing and constructing buildings'; 2. 'The style of a building with regard to a specific period, place or culture'. 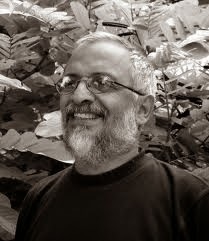 Shirish Beri is an artist; a practitioner of architecture – but the style of his creations cannot be confined to a specific period, place or culture. It is an extension, an evolution of the work of the greatest architect of all – Nature. Beri's creations refuse to be bound by the physical elements with which they were constructed; its spirit soars and pervades - he is an architect of the fifth element. The 1970s was a watershed era in environmental movement across the world. Though it was Rachel Carson's Silent Spring that woke up the West to the man-made disasters in the natural world, the environmental movement went into full swing after the historic Earth Day on April 22, 1970. One of the catchwords that emerged in the sudden enthusiasm for nature and environment was 'sustainability'. Sustainability got itself linked to almost all human developmental activities. Our Common Future, the Brundtland report, defined Sustainable Development as development that meets the needs of the present without compromising the ability of future generations to meet their own needs. Though seemingly innocuous and grand, the definition has hidden connotations. Needs of the present should be met with provision for meeting future needs. Who determines the present needs? The future needs? Would everyone agree to equitable distribution of natural wealth? The limits to development across the world cannot be uniform. Sustainability in practice is mere survivability. 43 years hence, how far has the world moved towards sustainable practices in the different spheres of life? be economical to build and operate. Looking at our national scenario of architecture and construction, one is appalled to note that sustainable architecture is the farthest thing in the mind of our construction industry. Despite the ecological and economical advantages of sustainable or green architecture, the industry spew forth concrete boulders all over the land with scant respect for anything. It reflects the same irreverence that the majority of the general public has for nature. The vernacular architecture, like agriculture, used to be sustainable until a few decades ago when the veritable gold mine of construction industry was discovered. There existed a culture which asked the permission of a tree before cutting it. There was a value system which was based on harmonious co-existence with the rest of the world. Remnants of such lifestyle can still be found in the remaining homesteads in the countryside. Each unit was self-reliant and self-contained. But the market economy destroyed such traditional values. It is in such a background that we should look at Mr. Beri's architecture. In his introduction, Beri is succinct; the objective of the book is to appreciate the important correlation between the manner in which we understand and live life, and the way we understand and practice architecture. He continues – my works are not designed to create iconic, grand, exhibitionist forms or graphic compositions that attract the eye, but to create more human, socially relevant, more natural and sustainable spaces that nurture the human spirit. Herein lies Beri's philosophy, his vision and mission of architecture. This is the crossroads where we decide to move on to the vast, deep hinterlands of Beri's world or not. This is where we begin the journey into the 'meaningful interface of the enclosed space and the open space'. To understand the work of an artist one has to understand the factors which shaped the personality of the artist. Mr Beri introduces his book through a series of images from his boyhood and youth, the periods which were critical to his evolution as an architect. A picture emerges of a life in empathy with nature. Trees, hills and water bodies showed him the pathway to appreciate and absorb the munificence of nature. This sensitivity and awareness of nature that developed in Beri at a young age did not die out or kept under covers as he grew up to adulthood and faced the challenges of life. This sets the man apart; whereas most of us succumb to the pressures of life and choose a life that is seemingly secure, Beri chose the different and challenging path; he undertook a journey to discover the purpose of his profession and his life. An observer can only stand aside and admire his fortune to be able to undertake this journey of self-discovery, which most of us never have the courage and conviction to do, the courage and conviction that made Beri chose to build a cottage in the hills over a Masters in Harvard. Nature is central to Beri's architecture. When for a conventional designer the first thing would be to clear the land, level the ground and build a concrete structure with a few gimmicks thrown in for visual pleasure, Beri begins from the principle of least disturbance to the landscape. 'Spaces inspired by nature' develops through eight essays; working with nature towards sustainability, spirit and space, learning and teaching architecture, aesthetics of ethics in architecture, connecting to nature, our house as our larger body, art as a metaphor in architecture and nature as art in architecture, and architecture without architects. Each section opens with the theme; the philosophy is accentuated with Beri's poems, which are the essence of his thoughts. There are several examples of his work with his initial sketches, plans and photographs which to the layman and architect is a revelation of the master creator's visions. The different sections are not water-tight compartments; on the other hand they flow in and out of each other, like the waters of a cascade. Therein lie the enchanting quality of the writing; perhaps the flaw also, because the lack of linearity may not be to the liking to some. A CD of the short documentary, ' The Unfolding White', an introduction to Mr Beri's work and vision comes with the book. Scripted, directed, photographed and narrated mainly by himself, Beri proves himself to be an artist of multiple hues. Mr Beri writes in a pleasant, highly readable conversational style. It is a discussion with fellow architects. One can almost visualize sitting with him beneath a shady tree with the cool lake breeze flowing in and birds chirping and a sleepy dog lying beside your feet. 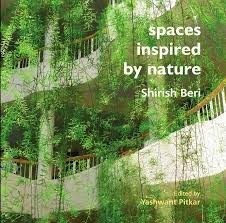 While a layperson who is interested in 'green architecture' would find it a kaleidoscope of different constructions ranging from a residence tucked in a hillock to a modern hospital or an international research centre, the book is primarily focussed on aspiring young architects and practitioners to enable them to discover the 'why' of their chosen profession. The style of writing reminds one of J Krishnamurti's dialogues. The book is an invitation to the reader to question, explore and find answers together with the author. It is not a text book of sustainable architecture, but a journey into its philosophy, ethics and application. In the section 'Working with nature towards sustainability', the author discusses the concept of sustainability. Sustainability, says Beri, is an attitude based on minimising consumption, empathy with nature and simple living. Its application reflects on designs with lesser energy requirement and construction processes that have lesser energy costs. Reduction of energy costs can be implemented at the different energy use levels. One is end-use energy level where use of green products and gadgets such as CFL bulbs and renewable energy sources such as solar, wind, heat recovery from air-conditioners etc., would reduce the operational costs. Similarly during the construction process, the embodied energy level, use of locally available materials can reduce the energy cost. Using recycled and recyclable materials and recycling of sewage water is another important aspect of sustainable architecture. 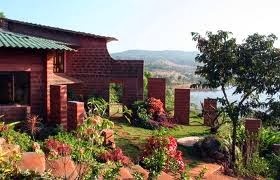 But is sustainable or green architecture being hijacked as a marketing gimmick, like ecotourism? Beri points out the gaps in the LEED ratings given for 'green' constructions. He muses over the hypocrisy of 'enjoying our green multinational sponsor's hospitality, on our jet flights, we discuss equity' (p.27). One has never been much of a believer in God as the creator, preserver and destroyer of life, an entity watching his/her subjects and doling out rewards and punishments. Yet, one often visits certain temples or churches because an undefinable sense of peace that envelops on entering the premises. Self-awareness as well as an awareness of the larger space around is awakened. One can feel this not only in temples but in different landscapes, from Mount Kailas to the backwaters of Kerala. Sometimes, even just observing a beautiful tree or looking at the loving eyes of one's dog is enough. There is no need to explain, no need to enquire. Everything is brighter, hallowed in a glow that lights one's mind. There are no questions, no answers to seek. Just being there is all that matters. This is the spirituality that Beri talks about, the awakening of consciousness from self-centeredness towards universal totality. This is the sense of interconnectedness with the cosmos. Can we infuse this spirituality into the designs of buildings? I am yet to see Beri's creations in a palpable sense, but the visuals in the book and CD convey more than what is obvious. Every single project detailed in the book connects with the reader. From the simple rough sketch to the photographs, it beckons to look deeper and beyond what the eye perceives. Spirituality cannot be defined or taught; it is an experience, unique to each individual. Only a writer such as Shirish Beri could almost succeed in conveying the spirit of the space. To transfer the intangible spirituality to the tangible is possible only for true artists. Architecture is frozen music, said Goethe. He is wrong; architecture is flowing music, the art of creating spaces throbbing with life; it is the art of breathing life into enclosures. Sitting down to write about something, the first question you ask yourself is about the title. Once you have succeeded in framing a title, the rest of the work flows from that phrase. The title is the quintessence of an article. Similarly, Beri in his quest for unique designs searches for the key word that would define the work to come. The client's brief, the topography of the site and the architect's vision are synthesised into a single word. For example, 'learning' was the key word to a school project. For the drug de-addiction centre where the patients had to break out of their mental prison, the theme was 'transparency'. This is the key that opens the door to the grand vistas. What makes each of Mr Beri's works unique is his skill in diving deep into the subterranean caves wherefrom the spirit of the creation bursts forth. The evidence of Mr Beri's success can be found in the words his clients. Whether it is school, college, research institute, hospital or a house, the inhabitants find the building not as a separate entity, but as an extension of their selves. “We have all become so close and involved with these spaces that we have almost forgotten the building. It has become synonymous with our work and life”. What a rich tribute! It would not be incorrect to say that architecture is the flagship of development. Development is synonymous with construction of buildings and buildings. As the science of architecture develops, it is imperative that the future architects be nurtured in the bed of ecological ethics. Beri advocates inclusion of ecology as part of the curriculum for architecture. The cornerstone of ecological ethics is what Aldo Leopold said: 'Examine each question in terms of what is ethically and aesthetically right, as well as what is economically expedient. A thing is right when it tends to preserve the integrity, stability and beauty of the biotic community; it is wrong when it tends otherwise'. Green architecture is more than pollution control, recycling, energy conservation, etc. The set of values that distinguishes green architecture should be inculcated into the minds of the young architects; they should develop respect and love for the natural environment. Yet, it is easier said than done. Achieving harmony with land is a goal, like absolute justice or liberty. Such aspirations are to be strived for, even if not achieved. In a 'seamless experience of the physical world', Beri's designs do not stand apart from the surrounding environment. Instead they blend with it, as if the buildings have evolved out of the landscape. 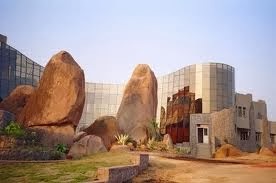 One of his most beautiful and fascinating design is that of the Laboratory for the Conservation of Endangered Species (LaCONES) in Hyderabad. Whereas one would associate a research centre with bleak, sombre, solid, straight lined concrete barracks, the LaCONES building looks as if it is part of the large boulders around which it has been raised. There are no straight lines here; the building is akin to a stream that is continuously flowing in and around through the rocks. There are no beginnings and ends; one feels one could explore it forever and discover something new everyday. Nature and the built spaces become one integrated whole. It is beyond the scope of this review to present the several works in the book. Suffice to say there cannot be many others which can be as fulfilling aesthetically and ethically. There is no compromise on either. Could that be the key to improving the quality of one's life? Of the society? It would be utopian to dream such a transformation in the society at large, but the choice is yours to strive for such a change or not. Vernacular architecture is concerned with domestic and functional buildings as against monuments, palaces and other public buildings. Beri details the characteristics of vernacular architecture such as climatic adaptation, simplicity, frugality, functionality, humaneness and an overall pragmatic approach which can be noted in the traditional architecture of different regions. But how much has modern architecture imbibed from vernacular architecture? The evidence lies all around us. Though a retro look is gaining popularity these days, it is only another way of flaunting affordability rather than assimilating the qualities of vernacular architecture. One hastens to google for images of Adyar foot bridge; Mr Beri's sketch is far better than the photographs. Reading the poem again, one ponders; there cannot be a better symbol – for the failed aspirations, the goals unachieved, and the dreams forsaken. It also symbolizes what we all strive for – to connect to the other shore, the shore of goodness, of happiness, peace and tranquillity. Sustainable architecture is on the other shore; only a few like Mr Beri has reached there. He shows how to build the bridge; the onus is upon us to lay the link that would take us across. The lines sum up what the reader would feel as he closes 'Spaces inspired by nature'. Spaces inspired by nature seems to be a compilation of few of the author's previously published papers. It is obvious by the occasional repetitiveness, the recurrence of the same concepts and thoughts in the different essays. The advantage is that one can pick and read at random. The disadvantage is that one does not feel a linear progression from the beginning to the end. While the excellent detailing of Mr Beri's works – the sketches, plans and photographs, along with the reflective, thought-provoking poems, the design and layout of the book makes it a veritable feast for the reader, editing of the text is found wanting. The essays are great read by themselves but a bit of pruning would have reduced the girth and the risk of slipping into tedium. Omissions in proof reading glare in a few places. One wonders at the total absence of mention of other contemporary architects and architectural thinkers who follow sustainable architecture. Any book of this kind cannot ignore the late Laurie Baker. Perhaps it was intended to showcase Mr Beri's works exclusively. 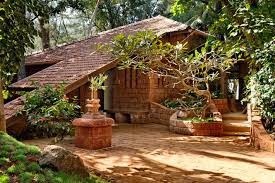 Vernacular architecture in the Indian context is based on Vaastu Sastra. Many of the concepts of sustainable architecture and reverence for the spirit of nature which lie spread throughout this book are rooted in Vaastu. It would not have been out of place to mention the hoary traditions of Vaastu Shastra. But the shortcomings of the book are negligible. Through the exposition of the philosophy which is the guiding spirit of his life and work, Shirish Beri has created his magnum opus in writing. Modern, young architects who aspire to leave their individual stamp on the architectural map, who are bold to take a different path from the conventional, who acknowledge the eminence of the Master Architect, Nature : for them, their raison d'etre can be found in Spaces inspired by nature.